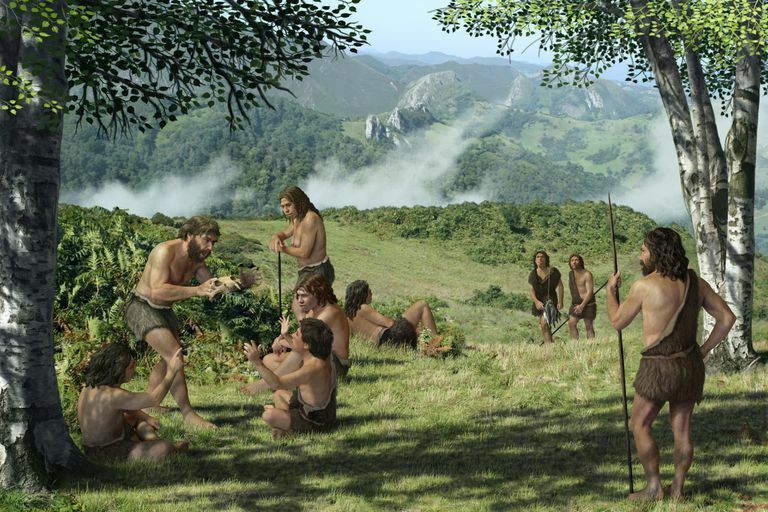 The Middle Paleolithic period (ca 200,000 to 45,000 years ago or so) is the period during which Archaic humans including Homo sapiens neanderthalensis appeared and flourished all over the world. Handaxes continued in use, but a new kind of stone tool kit was created--called the Mousterian, it included purposefully prepared cores and specialized flake tools. The living method in the Middle Paleolithic for both Homo sapiens and our Neanderthal cousins included scavenging, but there is also clear evidence of hunting and gathering activities. Deliberate human burials, with some evidence (if somewhat controversial) of ritual behavior, are found at a handful of sites such as La Ferrassie and Shanidar Cave. By 55,000 years ago, archaic humans were tending to their elderly, in evidence at sites such as La Chapelle aux Saintes. Some evidence for cannibalism is also found in places such as Krapina and Blombos Cave. The Middle Paleolithic ends with the gradual disappearance of the Neanderthal and the ascendancy of Homo sapiens sapiens, about 40,000-45,000 years ago. That didn't happen overnight, however. The beginnings of modern human behaviors are mapped out in the Howiesons Poort/Stillbay Industries of southern Africa beginning perhaps as long ago as 77,000 years and leaving Africa along a Southern Dispersal Route. A handful of sites seem to suggest that the dates for the change to the Upper Paleolithic are way out of whack. The Aterian, a stone tool industry long thought to have been dated to the Upper Paleolithic, is now recognized as Middle Stone Age, dated perhaps as long ago as 90,000 years ago. One Aterian site showing early Upper Paleolithic-type behavior but dated much earlier is at Grottes des Pigeons in Morocco, where shell beads dated 82,000 years old have been discovered. Another problematic site is Pinnacle Point South Africa, where red ochre use has been documented at ca 165,000 years ago. Only time will tell if these dates continue to be held up. And Neanderthal hung on, too; the latest known Neanderthal site is Gorham's Cave in Gibraltar, about 25,000 years ago. Finally, the debate still is unsettled about the Flores individuals who may represent a separate species, Homo floresiensis, dated to the Middle Paleolithic but extending well into the UP.